Tetra, Analog Synth Rack/Sound Module from Dave Smith Instruments. A Tiny Devil for the Road! 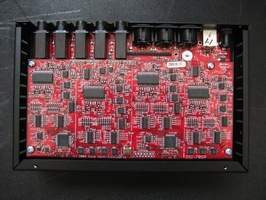 In 2002, Dave Smith decided to embark on a new hardware synth adventure in order to create instruments that would be pleasant to touch, program, play and hear... In those early days, he launched the Evolver: a small hybrid module that included digital waveforms from the Prophet-VS, as well as analog oscillators and low-pass filters. When it came out, nobody payed attention to a small integrated circuit in the unit: the DSI-120, which was developed together with Curtis — well-known for the VCOs, VCAs, VCFs, envelopes, and other integrated circuits he developed from the late 70's to the late 80's, and which glorified analog synths, transforming them into polyphonic and giving them more stability. 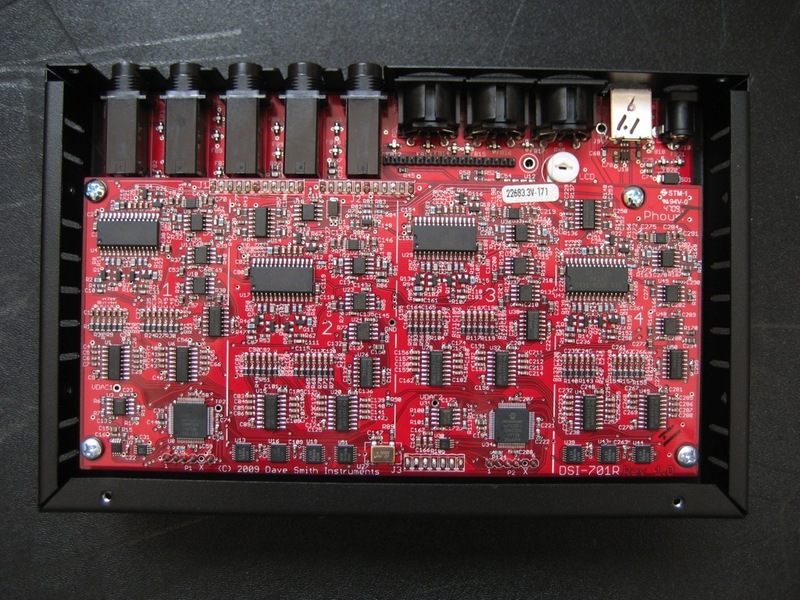 It was this same DSI-120 that was used for every voice of the Prophet-08 in 2007, making "modern" analog polyphonic synths affordable back then. 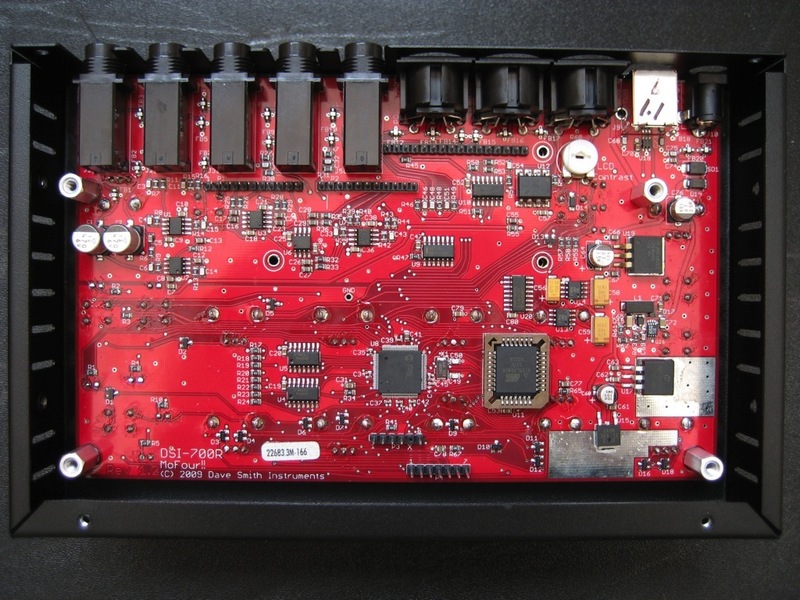 In 2008, the Mopho extended the already long career of the integrated circuit that provides no less than two DCOs, a low-pass VCF and a stereo VCA. 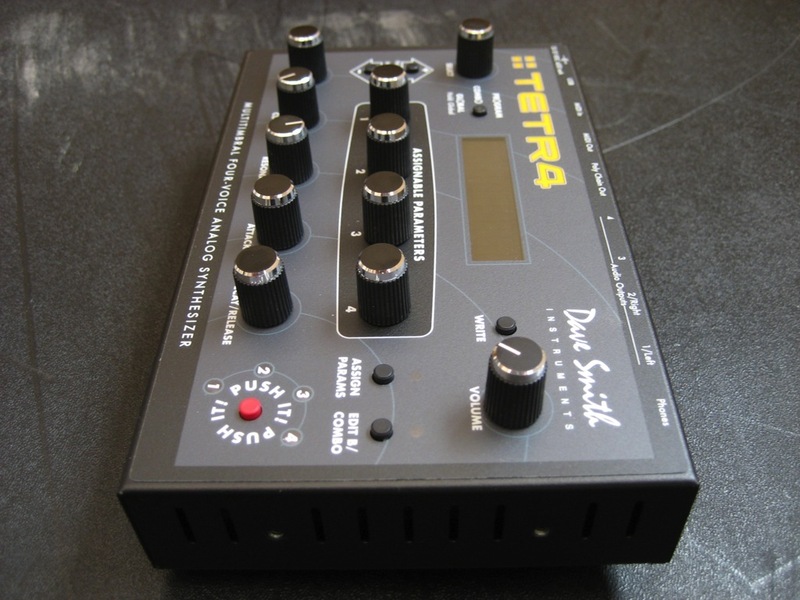 By the end of 2009, DSI presented the Tetra — a Mopho on steroids including four DSI-120 circuits! 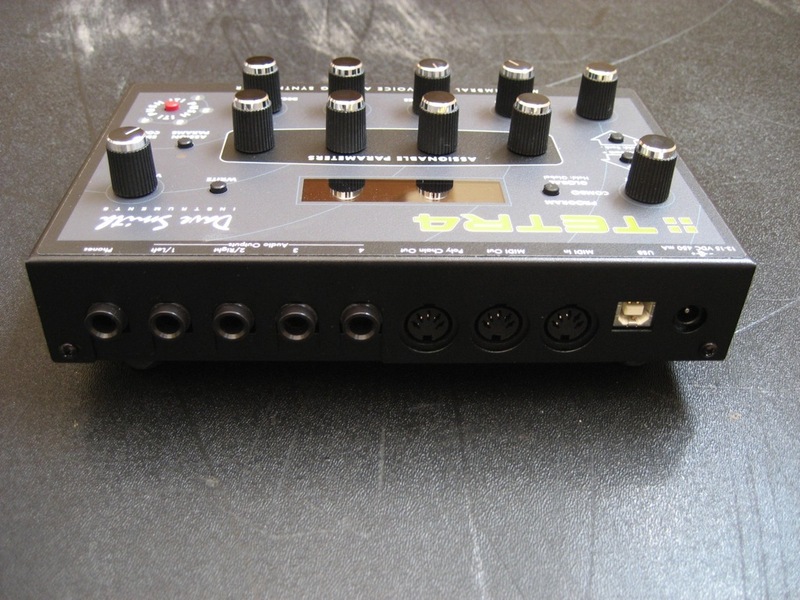 The Tetra is a bluish-gray compact module made out of rugged metal and fitted in the same housing as the Mopho. The housing is covered with a layer of Lexan (a printed, soft PVC sheet): the manufacturer says this solution is more expensive than standard silkscreen but adds features like higher printing definition, waterproof LCD and longer durability. 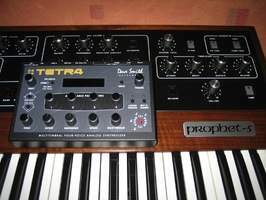 The rotary controls have black "deluxe" knobs with chrome binding that remind us of the Prophet-5, but smaller. 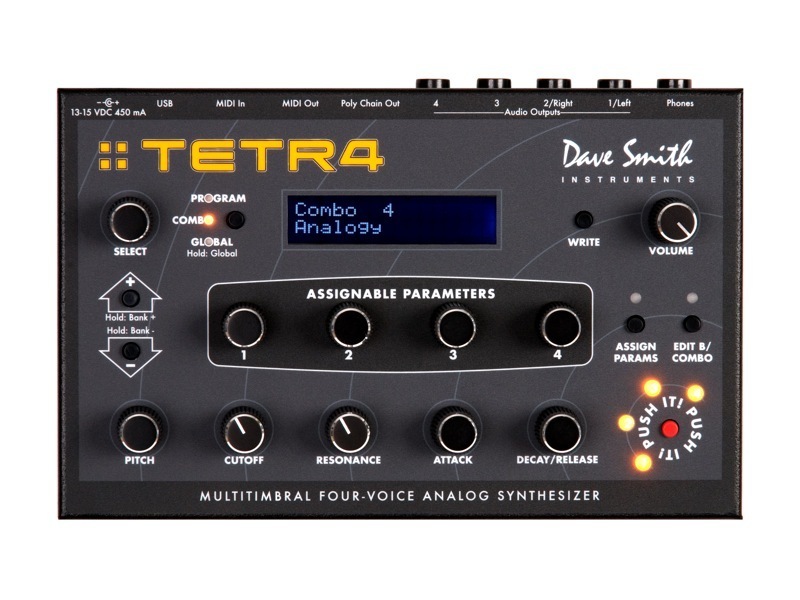 The Tetra features eight incremental encoders (pitch, attack, decay/release, select + four freely assignable encoders) as well as three potentiometers (volume, cutoff, resonance). All encoders have plastic axes, while all potentiometers are top quality and firmly mounted on the device. The choice of encoders or potentiometers for filter parameter control could certainly be discussed; some will prefer to edit signals accurately and without value drops or threshold effects, while others will prefer to get an immediate response over a short editing range. Dave Smith explains that customer feedback shows that most users choose the second option. Anyway, the potentiometers have three different responses: Jump (the edited parameter jumps to the value matching the physical position of the potentiometer as soon as you turn it), relative (the parameter changes smoothly according to the physical range still available) and passthru (the parameter changes only when the physical position of the potentiometer passes through the stored value). In the middle of the front panel you'll find an easily readable, blue backlit LCD with 2 x 16 digits. The rest of the front panel is scattered with small selectors: playing mode, navigation (programs/banks), memory save, encoders' assignment mode, editing layer, and note triggering ("Push It!" with activated LEDs when the Tetra plays back tones). In combo mode, each voice can be assigned to a different sound. That way you can play voices in unison or independently (multitimbral mode with separate Midi channels or modular mode with four different programs played alternately from the same Midi channel when you hold the notes). You can create arpeggio sequences moving in every direction (Combo 1, Combo 2). However, we did notice several limitations: first of all, the multitimbral mode (control of four independent Midi channels) is global, not by Combo. Moreover, the B layers of the programs are deactivated in Combo mode, which makes it impossible to have two stacked or separate layers in the same multitimbral channel. Finally, unison programs cannot be stored because only one of their voices is controlled by the channel. Luckily, edited sounds in combo mode are independent of the programs so changing them won't affect the programs and vice versa, which is very good news for sound management. The Tetra provides 128 memory locations for Combos. Notice that you cannot control audio levels, pitch range, velocity, pan, etc. like with a digital workstation. Finally, Combo mode is useful to stack sounds as well as to trigger arpeggios and rhythm sequences but not to manage several programs simultaneously and independently. The Tetra equation (4 x Mopho) is not verified. 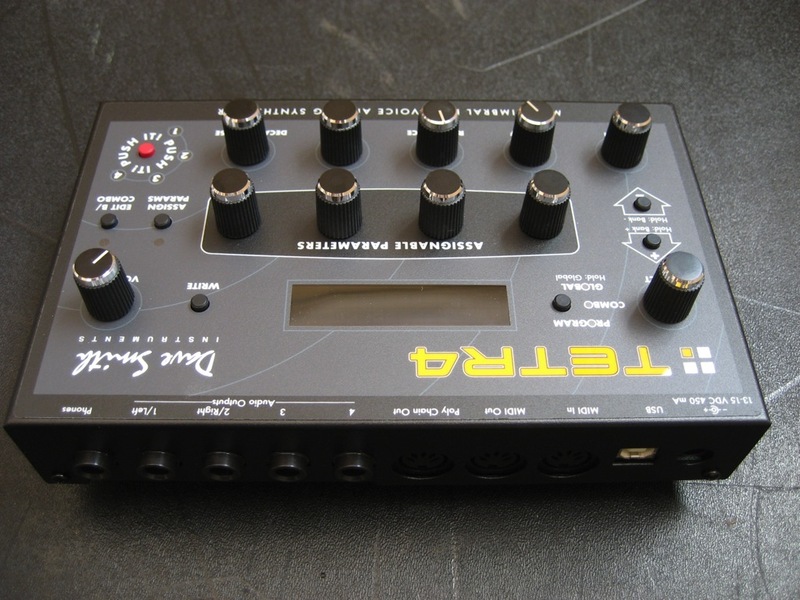 The Tetra is an analog, polyphonic, four-voice multitimbral synth. It works in two main modes : Program and Combo. Each program includes two sound layers that can be played by themselves (four-voice polyphony), stacked (2+2 voices) or separately (with editable separation points for each program). The user memory includes four banks of 128 programs packed with factory presets. 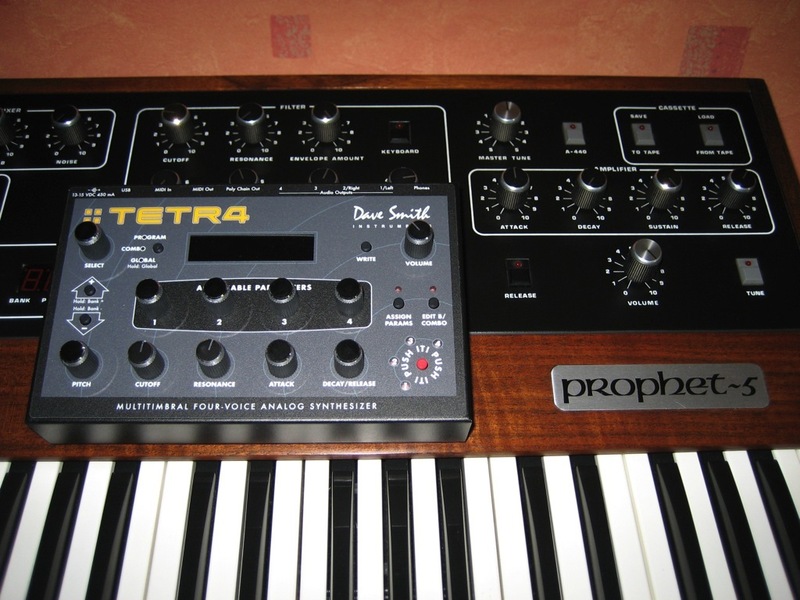 The first two banks are the same as in the Prophet-08: both synths are fully compatible since the Tetra includes all synthesis parameters of the Prophet-08 plus two sub-oscillators and a feedback loop (see below). Among the banks (recorded without effects), you'll find strings (in T8 style), fat sync presets that remind the Prophet-5, typical bass sounds (bass 1, bass 2), B3 simulations, voices, leads, etc. The additional sub-DCOs allow you to make pad sounds based on PWM fatter. With the Split mode you can combine sounds like bass and pad (split 1, split 2), but you'll run out of (polyphony) voices very quickly. To summarize, factory programs are not exceptional; they include a lot of short sequences that sound like demo sounds. But synths — especially analog synths — were made to be edited, right? Each of the four Tetra voices is 99% the same as a Mopho voice. The audio engine goes a step beyond most standard analog synths (see diagram). Everything starts with the oscillator section with two DCOs (digitally-controlled analog oscillators), two sub-DCOs and a white-noise generator. The DCOs cover 10 octaves (8 Hz - 8 kHz) in steps of one cent of a semitone. All standard waveforms are available: sawtooth, triangle, sawtooth + triangle, and pulse with variable-width modulation from 0 to 100%. DCO2 can sync DCO1, meaning it forces DCO1 to restart a cycle when it restarts its own cycle. This results in metallic sound effects when you, for example, modulate the pitch of DCO2 with a decreasing envelope, the modulation wheel or a small glide. Each DCO includes a glide whose speed can be constant or dependent on the interval between legato notes. In order to simulate the unstable behavior of vintage VCOs (voltage-controlled oscillators), just play with the dedicated Slop parameter. You can adjust the balance between both DCOs very precisely, as well as the volume of each of the sub-DCOs (square wave generators tuned one and two octaves below the root). Applications: sub-lows. In this stage, you can mix the output of the white-noise generator, as well as the post-VCA feedback of the left audio channel signal. It allows you to add subtle saturations or staggering distortions. The device has no ring modulator but you simulate this effect by modulating the filter frequency with the audio of a DCO (see below). The Tetra has a simple but effective low-pass filter. It sounds vintage in most applications and has a very personal sound character. The cutoff range is pretty wide: 13 octaves. We really like its high definition (164 steps) that smooths out the response, even though it doesn't quite reach the Minimoog Voyager's 14 bits (16,384 steps!). The filter can be self-oscillating when in four-pole mode. And it is in this mode that it shows its strongest sound character. In comparison, the two-pole mode sounds duller; we were expecting more musicality and coloration, like on a vintage Oberheim for example. The cutoff frequency can follow the keyboard over a range from 0 to about 1 tone per note. It can also be audio modulated by the DCO1, which results in bell-like resonances and makes up for the lack of a ring modulator. It can also be modulated directly by a dedicated envelope (ADSR with delay) and the velocity. The signal then passes through a stereo VCA whose left output is used as pre-filter feedback signal. The audio engine is exactly the same as on the Mopho except for the number of voices. 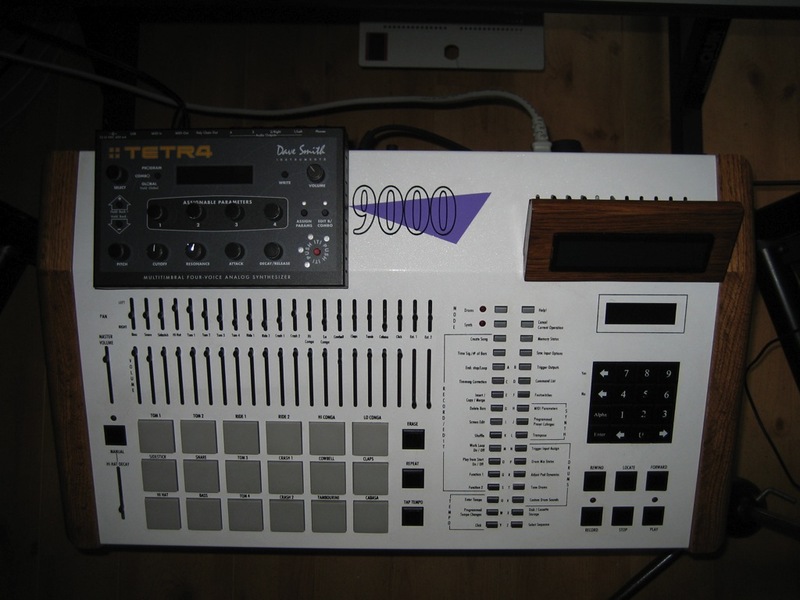 The 1% difference between both instruments applies to the fact that the Tetra has no audio input to process external signals (thus, no gain parameter for external routing) and that the Tetra is a polyphonic synth. This results in an additional stereo width parameter called Pan Spread. Voices are alternatively played in different positions of the stereo field (like the PPG Wave 2), while the width can be programmed and modulated. We then find the unison mode where all four voices are played at the same time with an editable parameter to detune and enlarge the sound. Needless to say, a bass or a solo can sound bombastic with the Tetra, as you can hear in the following sound samples of fat basses with eight DCOs + eight Subs (bigbass 1, bigbass 2). 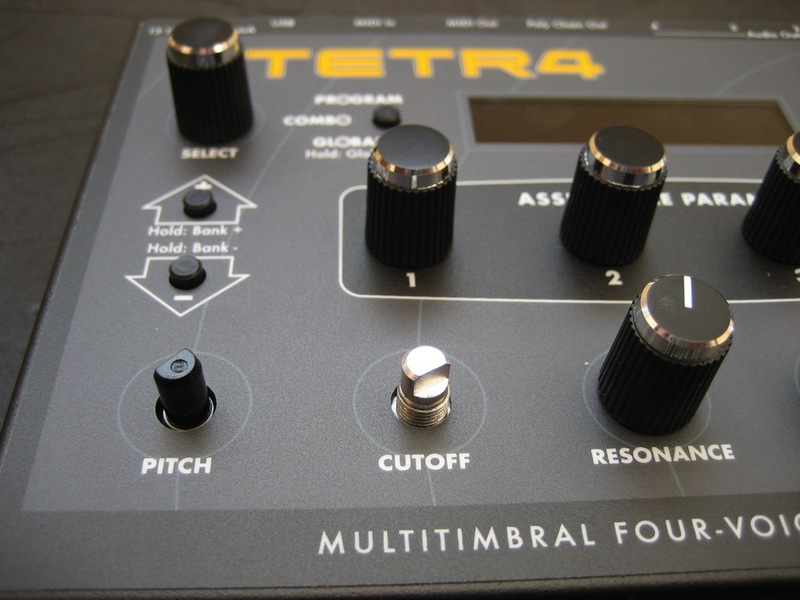 Fans of moving sounds will love the Tetra — it allows you to modulate almost everything in perfect sync. Unlike with vintage analog synths, all modulations are controlled by the processor. 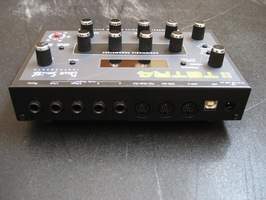 You get four wide-range LFOs (0.033 Hz – 261 kHz, in other words from a 30-second period to audio levels) that are fully assignable and synchronizable to the internal or Midi clock. All standard waveforms are available: triangle, inverted sawtooth, sawtooth, square, and random. The cycle can be forced for each new note. On the other hand, there is no delay, nor modulation start or stop parameter so it requires the use of an envelope and an appropriate connection in the modulation matrix (see below). Next, you'll find three ADSR envelopes with delay. The first two are assigned to frequency cutoff and volume. The third envelope is fully assignable and can be looped. These envelopes are pretty fast, considering that they are digital, and they provide a lot of punch to the sound, as can be attested by the different percussion analog sounds that can be generated. 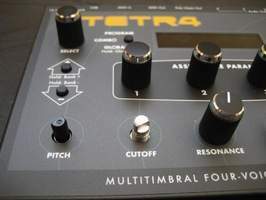 If it moves, it ain't dead... And the Tetra is surely not dying, considering that it adds a multitimbral arpeggiator and a multitimbral sequencer to all modulation possibilities described above. The basic arpeggiator offers only four modes (up, down, alternate, struck order); no octave range, no hold mode, it's very basic... On the contrary, the sequencer allows you to program four sequence tracks of up to 16 steps, like with analog sequencers. To start it off, simply press the "Push It!" button and play. You can even proceed step by step with each keystroke. A sequence track corresponds to 16 steps of one of the 47 destinations in the modulation matrix (for example: pitch, filtering, volume and position in the stereo field). These settings can be made in two modes: absolute or relative (to the first note played). You can mute a step and loop a track at any step of the sequence, regardless of the duration of the other tracks. This allows you to create complex sequences from a single program. Which means you can get four tracks of four sequences with four different sounds in multimbral mode. This has been one of the main advantages of all DSI products ever since the company was founded. And this comes as no surprise, considering that Dave Smith started his career a long time ago developing analog sequencers for his first company — Sequential Circuits Inc.
As a summary, the Tetra is a powerful polyphonic, multitimbral analog synth. Its price is very reasonable considering that this compact unit hosts a real sound synthesis monster with only a few direct controls. This, however, is also its main limitation because the design doesn't allow direct and easy editing. Thus, the Sound Tower editor is indispensable. If you consider the Tetra's outstanding sound quality and the lack of serious competitors, it ought to take you no time to understand that it is the perfect live instrument to complement digital synths and other cold-sounding workstations. So, when is the keyboard version coming out? Audiofanzine: since last year and our review of Mopho, the DSI team has one more time grown – this time by 25%. What do you think of this spectacular evolution? Dave Smith : Wow - we're getting really big now! It seems that musicians really like our products, and we want to make sure we continue to make interesting new instruments, and support our customers. Audiofanzine: Tracy, what is your background and how are you involved in the DSI team? Audiofanzine: Dave, after this 7 years experience, how do you feel about the DSI adventure and how do you compare it with the SCI adventure? Dave Smith : It's completely different, of course. Sequential was a great experience, but it was a much larger company. DSI is more about having fun and making cool instruments with a small company. Technology has come a long way in 30 years, and it's possible to do so much more with fewer people than before. Audiofanzine: Let’s talk about Tetra. This may not have been easy to make so many voices go into such a tiny box? Dave Smith : It was tricky. I used smaller components than on our other instruments, and used some other tricks to fit the 4 voices onto one small board that we stacked on another board which contains the panel components. Audiofanzine: Why did you choose pots instead of encoders for the filter commands? Dave Smith : We have determined that more of our customers prefer pots for controls like filter cutoff that are usually used in live performance. Audiofanzine: Are you working of an OS improvement for an easier Combo / multi mode edition and management? Dave Smith : Yes. We originally debated whether or not to include combo and multi at all in the design, since we knew there would be limitations with the small front panel. But we decided to go ahead since they add a lot of capability, even though we kept it simple. But, we have some ideas to make them work more smoothly, and hope to have an update very soon. Audiofanzine: After the great Mopho keyboard, is there any Tetra keyboard planed or coming soon? Dave Smith : We seriously considered it, but the mopho keyboard made much more sense, so that's what we made. The tetra keyboard would not have been at a good price point, and had some other issues that would have made it less successful. 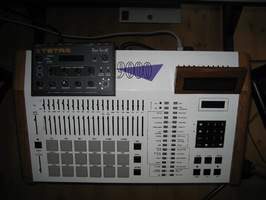 Besides, with the mopho keyboard, you can poly chain a tetra for 5 voices in a very small footprint! Audiofanzine: Are you already working on the design of the next generation of the DSI-120 chip with Curtis or others? Dave Smith : Unfortunately Doug Curtis passed away a couple years ago, so there will be no new designs. We are looking into other options for future products though. Additive Synthesis ─ Give me more!